Are you looking for delicious vegetarian recipe that is filling and easy to make. Look no more, Try this Sesame Lentil Salad recipe seasoned with my favorite vegan product: Blue Dragon Sesame Oil. I am not vegetarian nor is my family. But during my annual check up, I discovered a high cholesterol level that needed to be addressed. It is not alarming but to be cautious, I had to take some measures. One of the doctors’ recommendations was to reduce my intake of red meat. I had to make some changes to my diet. So I started looking for vegetarian recipes that are easy to make and also filling. Nothing better than lentils to fulfill both needs! I never considered lentils in a salad until I stumbled on this Blue Dragon sesame lentil salad recipe. It sounded delicious and super easy to make. Cook the lentils as per the pack instructions (rinse well, boil lentils:1 part lentils, 2 parts water) until al dente. Rinse and drain. Add the olive oil and stir thoroughly. Meanwhile make the dressing. Peel and finely chop the ginger and garlic. Pound to paste in a pestle and mortar. Add the juice of one lemon. Add the sesame oil, sugar and salt. Stir well. Finely chopped the red onion. Chop the baby tomatoes in half. Add to the lentils. Add the dressing and mix until the lentils are well-coated. Finally, add the natural yogurt and stir well. What a delicious and refreshing spring salad recipe. I enjoyed every bit of it and so did my husband. I stored it in air tight container in the fridge for 2 days. It stayed fresh and delicious. My vegetarian experience turned out great and I am going to repeat it with other Blue Dragon Canada vegan friendly products. Did you know that the following products are 100% vegan? Think of all the amazing vegan recipes you can make with all those yummy Blue Dragon products! 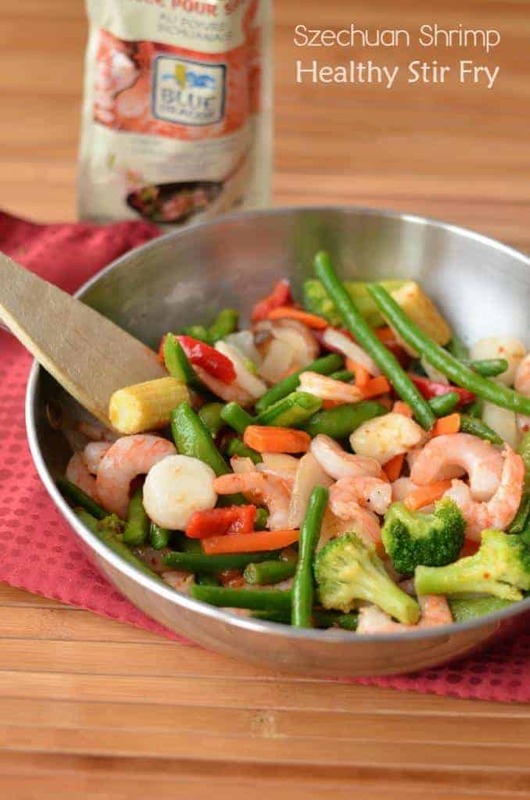 You could make this delicious healthy stir-fry recipe by simply removing the shrimp! Every other part of it is vegan. You could also substitute the shrimp with tofu! The tofu will pick up all the yummy Szechuan Pepper Stir Fry Sauce! Did you know that Blue Dragon has a fantastic Tumblr sharing all sorts of delicious recipes? Be sure to check it out for more inspiring East Made Easy vegan and vegetarian recipes! Don’t forget to follow them on Twitter and Facebook too! Have you tried this easy Sesame Lentil Salad recipe before? What kind of delicious vegan recipe would you make with Blue Dragon products? This recipe sounds delicious, I can’t wait to try it, thx! I love vegetarian meals like this. 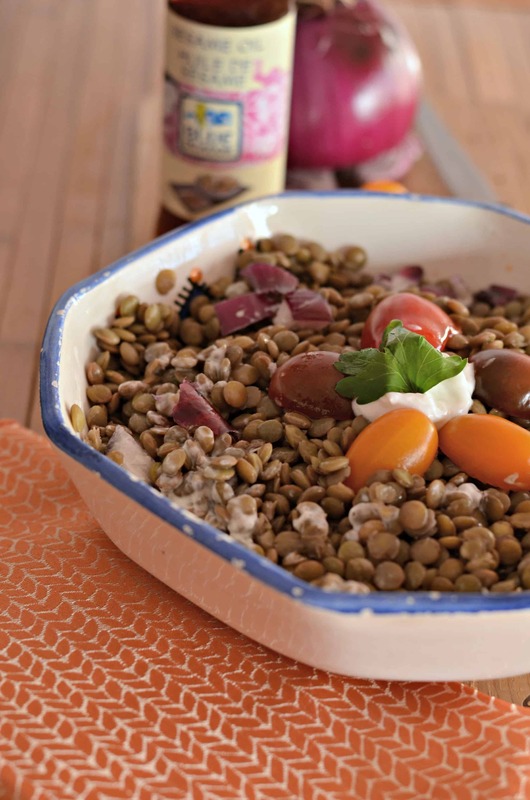 I’m a longtime lentil fan and can’t wait to try this recipe! It sounds absolutely delicious! Made this yesterday for lunch – and am eating leftovers today for lunch. So good – love the ginger & lemon. Thanks so much for sharing, it will definitely be a repeat recipe! I love lentils! This dish looks so delicious! This would be a great easy summer dish! Seems like easy to prepare and all healthy and yummy at the same time! The shrimp stir fry looks so fresh and delicious as does the yummy lentil salad. This looks fantastic. I love that it’s healthy too. This looks absolutely fabulous! I’ve never had a salad with lentils. We love lentils at our house and with a daughter who is a vegetarian, I just know that she’ll love this! Looks delicious! I never tried lentils in a salad. My husband loves vegetarian salads. Will have to try this recipe. Thanks for sharing. I have only ever had lentils in a soup, never thought about using them in a salad. Thanks for the recipe. You’re right there are so many great things that could be made w/the Blue Dragon products. The lentil salad sounds really good too. I love new recipes and trying different things like the lentil dish, I thin it would be something that I would enjoy and be great as a side in the summer! Also, your shrimp stir fry makes me drool, you can’t beat shrimp! This looks fabulous and so very healthy. I would absolutely love that salad. I will have to give it a try. 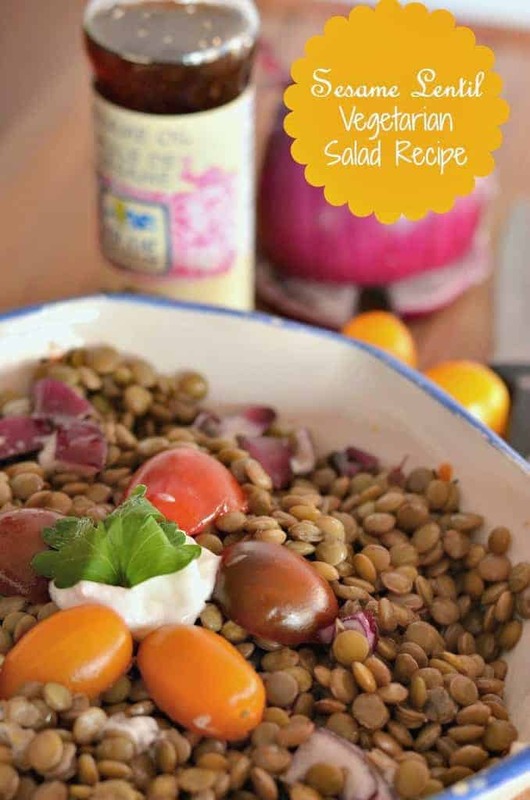 Lentils are so amazing, what a great salad to try! That shrimp stir fry is out of this world. YUM! I have not tried this dressing before. I would absolutely love to give it a go on that stir-fry though! I bet my husband and daughter would love this. They’re both vegetarians and are always looking for new dishes. I love lentils! I use them in a lot of recipes, especially in the crockpot. I would try this for sure. This looks really nice an protein filled. I like the flavor that sesame oil gives. This looks soooo good! Lentils are actually something my kids LOVE! I am always looking for new ways to serve them up! These salads look great. We have lentils at least once a week but rarely ever in salad form. I love vegetarian meals like this. I need to try this out. I need veggie meals like this for when the meat-eaters aren’t at my house! I’ve never had lentils in a salad before, only in a soup! It looks amazing, though! So does that stir fry! That sounds like a wonderful lunch! I am going to pick up the stuff to make this. My daughter eats mainly vegetarian. She would love this lentil salad. I’ve never done lentils before. I think I might give this a try to see what I think. Pinning for later use! I have never seen or tasted a lentil. This dish looks fabulous and so healthy.